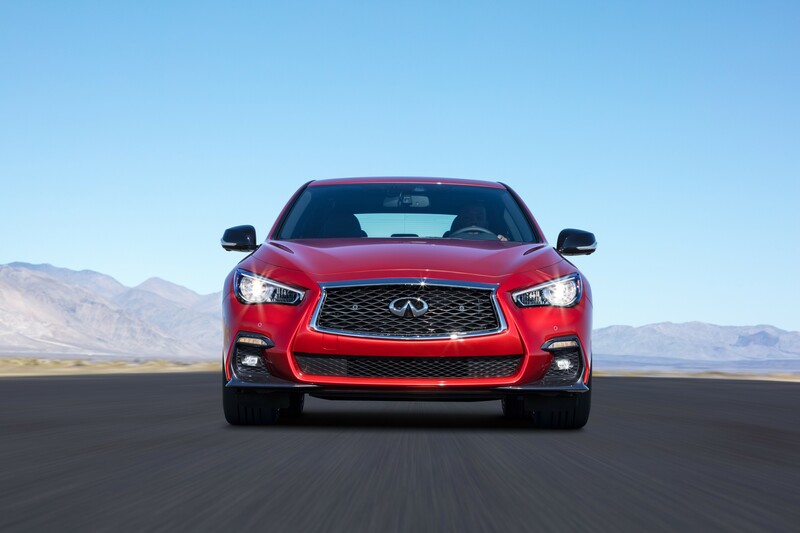 ROLLE, Switzerland – INFINITI announced prices for the full line-up of its updated 2018 Q50, a few days before the premium sports sedan goes on sale. The 2018 Q50 features significant Design modifications, equipment upgrades and technical enhancements related to INFINITI’s Direct Adaptive Steering (DAS) as well as Vehicle Dynamic Control (VDC). Prices for the entire line-up can be found on our country-specific media subpages (www.infinitipress.eu) and soon on the INFINITI customer homepage: www.infiniti.eu . All 2018 Q50s will benefit from an update to INFINITI’s signature double-arch grille, which creates a strong first impression. The grille's three-dimensional, textural quality has been enhanced with a deeper detailing of the waved mesh-pattern surface and chrome surround. Rising from the double arch grille is a smooth and commanding character line, which flows energetically through the side of the body like a wave, creating a highly fluid profile – a trademark INFINITI look. Greater levels of craftsmanship are central to the interior design modifications. In particular, leather-like materials now surround the instrument panel and are finished with double stitching. Also, Kacchu Aluminium interior trim is now standard on the Premium grade of the new Q50. It upgrades the touch and feel of the dashboard as well as the doors of the vehicle. A new steering wheel features molded positions for the driver’s thumbs, and affords intuitive fingertip access to reshaped steering wheel-mounted gear-shifter paddles. A new performance-oriented leather shift knob – like the instrument panel, also bearing double-stitched seams – is surrounded by new chrome trim and features an inlaid INFINITI logo. In addition, the new Q50 interior features INFINITI’s hallmark ‘spinal support’ seats – carefully engineered to provide a consistent level of support and minimize pressure on lower and upper back muscles. On the Q50S 3.0t sport version, INFINITI offers a special design with black glossy mirror caps as well as dedicated 19” wheels including red brake calipers. Specific interior design elements are a black roofliner, chromed paddle shifters, dark chrome inserts as well as red stitching and quilted leather seats, all of which are available on the top-of-the-line version only. Innovative drive assistance technologies that empower and support the driver are abundant on the Q50. They include available Direct Adaptive Steering, Active Lane Control, Intelligent Cruise Control, Distance Control Assist, Back-up Collision Intervention, Blind Spot Warning and Intervention, Lane Departure Warning and Prevention, Forward Emergency Braking, and Predictive Forward Collision Warning. The optimized DAS system on the 2018 Q50 offers an enhanced steering feedback feel on limit handling. On the sporty Q50S 3.0t-liter version, VDC was further finetuned with an enhanced balance between brake and torque-cut. The 2018 Q50 delivers a rewarding driving experience with a variety of innovative powertrain options. Leading the list of four available 2018 Q50 powerplants is the exclusive VR-series 3.0-liter V6 twin-turbo 405PS engine, which has been named one of Ward’s ‘10 Best Engines’ for 2017 – one of the highest global accolades in engine technology development. In addition, there is a 2.0-liter four-cylinder turbocharged unit, rated at 211PS, and a 4-cylinder 2.2L direct injection turbo diesel which delivers 170ps. Finally, the Q50 is also available with an advanced gasoline-electric hybrid, which features INFINITI’s proven Direct Response Hybrid® system with Intelligent Dual Clutch Control. The hybrid system net power is 364PS, providing lean fuel economy while offering a response with thrilling immediacy, accelerating in 5.1 seconds from 0 to 100km/h. The Q50 continues to be available in four grades: Q50, Q50 Premium, Q50 Sport and Q50 Sport Tech. New for the 2018 model, the INFINITI Navigation System with traffic information and Digital Audio Broadcasting (DAB) will come as standard equipment on all models. Additionally the 3.5-litre V6 Hybrid powertrains are now also available on Premium grade, allowing access to these versions at a lower price point. INFINITI’s new Q50 will be on sale in showrooms across Europe as of October 2017. More information on the 2018 INFINITI Q50, along with the full INFINITI lineup, is available at www.infinitipress.eu . All prices can be found below or under www.infiniti.eu .